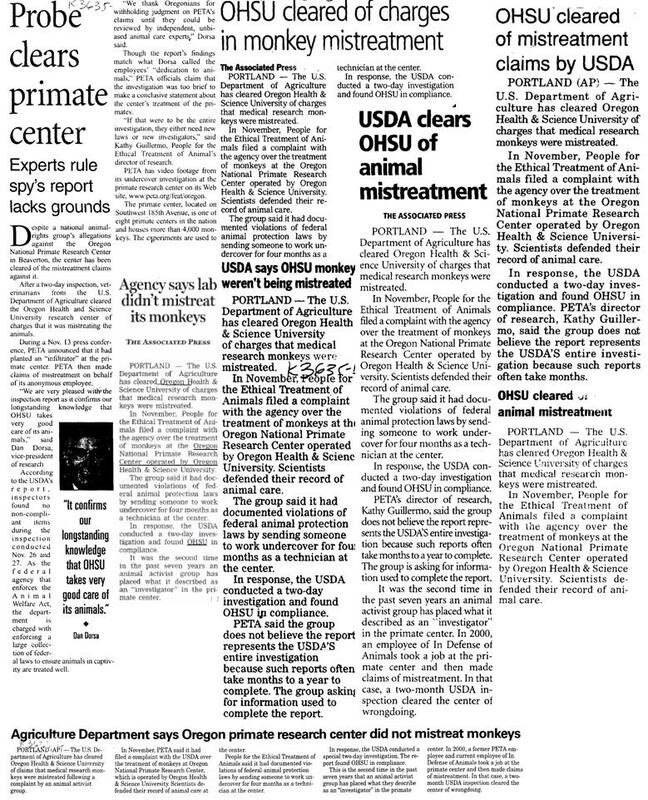 It seems Peta is running out of news lately – so its front page has decided to bring back the story of mistreatment of animals at Oregon National Primate Research Center – a story which turned out to be completely false when the USDA investigated. Want proof? Here’s the USDA report giving ONPRC a clean bill of health. It seems that Peta forgot to check the newspapers after their infiltration because there were plenty of stories regarding the perfectly acceptable conditions inside ONPRC. So for the benefit of Peta members, here’s some of the news coverage. Claim 1. Employers spray high power hoses to clean cages with monkeys inside – soaking the monkeys and upsetting them. Truth: The Peta video is filmed so that most of the cage is not visible. You cannot see that the technician is actually cleaning the pans beneath the cages while the monkey is safely perched on a shelf away from the water. This is a regular occurrence and does not distress the monkeys. Here is actual footage showing what happens during pan cleaning (rather than Peta’s video which shows how the ceiling appears during pan cleaning). Peta’s claim that the noise of the water hitting the cages causes the monkeys distress is unfounded when one considers that the monkeys are not sitting right next to the point of impact, but a few feet above on a shelf. Claim 2. Technicians chase monkeys around their cages in order to move them. This causes the monkeys great distress. Truth: Unfortunately if you have a large cage then it will is more difficult to capture the monkeys (but most would agree that the other benefits of a large cage, such as the one seen below, outweigh this minor inconvenience). The large cages allow monkeys to move around and play freely – improving animal welfare and adhering to the principle of Refinement within the 3Rs. In order to reduce the need to “capture” monkeys, positive reinforcement is used to train monkeys to help researchers. Below we can see a monkey being trained to press a button, and later the monkey will be trained to offer up an arm of leg for blood samples. Truth: Rectal Prolapses are a minor problem for monkeys in captivity, similar to hair loss. These problems come and go without causing the monkey much discomfort (if a monkey does appear to be in pain then a veterinarian will attend to them promptly). Claim 4. The conditions cause monkeys to go mad – animals can be seen in distress, whirling or pacing inside their cages. Truth: This is perhaps one of the most insidious claims. Peta try to insinuate that the monkeys seen are acting as they always do – whereas it appears that they are acting alarmed by a presence outside their cage (perhaps one with a camera…) This is most certainly not ordinary behavior, and there is a strong chance that the animals filmed are stress-sensitive monkeys used for certain types of experiments at ONPRC. However the fact remains that the footage was almost certainly taken as soon as the intruder entered the room and before the animals had time to acclimatize themselves to the new presence. See the video below for a comparison of Peta’s footage to film taken by members of ONPRC. The following video was entirely shot by Oregon Primate Center (not PETA) to illustrate how certain stress-sensitive monkeys (used for research into behavior) will act abnormally when in the presence of something new (a camera – that looks like a big eye), but will settle down when they realize it is not a threat. Check the previous video to see how a PETA infiltrator misused this fact. We look forward to next week when Peta will be reporting on cruelty to animals by the Ancient Egyptians. Posted on July 4, 2008 October 5, 2013 by EditorPosted in Animal Rights News, News, Science News, SR NewsTagged cruelty, mistreatment, monkeys, ohsu, onprc, Oregon, peta, primate, stress, USDA, youtube. As a former animal care technician at this facility, I am pleased that someone FINALLY is telling the truth. I had major concerns when I first took the position, but had just relocated and needed a pay-check. I had expreience as a veterinary technician when I applied for the research job. The aninmals I cared for were for the most part calm and behaved normally once they got used to my presence (as your videos show). Many of the animals on the PETA video are animals I know well, and I was distressed to see them behaving in a manner that was not typical. It was painfully obvious that they were being provoked or harrassed. Some of the behavior on the PETA video is that of aggression and would only be caused if the animals felt threatened. A camera or direct eye contact would do just that. During my training at the center, I was taught how to best interact with the animals to keep stress levels low. It is important for the animals health and the validity of the studies. Thank you! Here’s another interesting story about PeTA, this time thanks to the Pharyngula blog http://scienceblogs.com/pharyngula/2008/08/that_crazy_canadian_news_story.php#more. PeTA appear to have annoyed a lot of people in Canada by comparing the slaughter of farm animals to the murder of a young man named Tim McLean on a bus. Thankfully local newspapers did not print the advertisement. At least PeTA have the comfort of knowing that they’re not alone, the notorious Westboro Baptist church were planning to picket Tim McLean’s funeral, but were prevented from doing so by Canadian authorities. PeTA and the Westboro Baptists, now there’s two organizations that deserve each other!